You've got to be kidding.. Oh come on.. you'd think for a second... okay alright.. sorry.. he's hot.. Which reminds me.. My darling husband has been fighting back.. he decides to.. a couple days ago.. delay playing a game with me by watching TV in the other room. 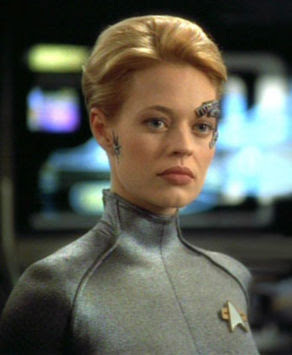 I'm wondering what is taking him so long.. (he did say he was coming to play.. "Soon™") so finally he comes in with a grin on his face... logs into the game I'm playing (an online Role Playing Game) and announces to his male friends that he got his Jeri Ryan fix for the day.. ANYWAY.. where was I .. okay.. I was staring at the Nagano picture.. and immediately thought of a new song I found. This particular song I found by complete accident. Earlier in the year I actually found the the song..
.. and no... I haven't seen the anime Full Metal Alchemist of which this is the Season Two opening theme... yes yes.. I know.. Sacrilege.. Anyway.. I fell in love with the song and bought the SMILE album since it had both the Full version of the Ready Steady Go! Song and the Karaoke version (which they called "Hyde-less" version). One day I pop in the CD in my player and start it from the beginning and BAM I run into Kuchizuke from the start.. It's the first song on the album. I was very surprised to hear this song. I don't know much at all about the band and frankly hearing the rest of the album was okay.. I got my money's worth by getting 3 songs from one album I like listening to. The others are a bit too JPoppy for me. Back to Nagano (Sorry Holly and Tricia.. LOL).. One of the rare times you see him GOOD in jeans.. I mean wtf.. does this man not own a good pair of jeans? 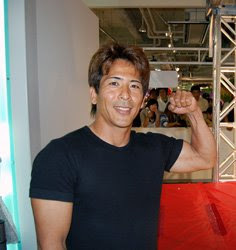 Apparently in 2007 he did as witnessed in this Muscle Park Blog dated May 4, 2007. P.S. This was probably the last time you see Nagano not announce his "visit" since apparently from the pictures.. he was instantly recognized and caused quite a stir.. I think it was the jeans.. Why was I staring at the old picture anyway? Because he's going to be in Muscle Park on Saturday, July 19th! Here's to hoping Monster 9 decides to tape this sucker so I can see it in Sasuke Maniac! I really do hope a) He wears jeans again.. b) TBS shows it on Sasuke Maniac so I can c) BLOG IT! Face it, Nagano makes a paper sack look good. Except for the rolled up jeans and white legs (put on your shades everyone!) has he ever looked bad? And actually, he didn't look horrible in those rolled up things. Don't think I've ever or will ever complain about one of his pictures. Love this pic arsenette! I lost the pic of him sporting jeans while he was at some kind of ship building event that was from bunny's previous site. Thanks for keeping all of us up-to-date with the latest news. Hiya - I found your blog because I just got really into Sasuke and I've really been enjoying reading your comments. (and looking at your caps!) Nagano looks great in jeans, I wish he'd wear them more often!! Also, I just started listening to L'Arc En Ciel recently and Ready Steady Go is one of my favorite songs of theirs - it's so great! I haven't heard Kuchizuke yet, I'll have to check it out. Anyway, thanks for all the fun Sasuke posts! Boy, he really does look great in jeans or anything else he wants to wear (even that worn out NM shirt)! I pretty much depend on your blog for Sasuke related goodness, then I come here and am horrified to learn that you are "distracting" yourself from it! Luckily, that was the worst attempt at not talking about anything Sasuke related I have seen since, well, me! Thanks! Karen I have the picture but trying to find the actual site (I believe it's best to actually link it so they get credit as well (and I won't be sued LOL)). I'll see what I can come up with this afternoon. P.S. Thanks Laura! I really did fall in love with that song! I think you might like it too if you liked Ready Steady Go! Hi! Thanks for telling me about your blog, it's awesome! Makoto wearing jeans is just... I don't even have words to describe it! Now I'm going to read all the older posts and watch all the pics... This will be a Ninja warrior full immersion! Hello Francesca! Oh I hope you enjoy it :) It's the tip of the iceberg though. I started with Sasuke 20 being the 10th anniversary. Maybe I'll do other posts of the older ones.. hmm.. that's a project LOL. Thanks for the mention Arsenette! Enjoyed the post. Aww Thank you very much Mr. Mike :) Though I keep thinking of your own blog .. er.. specific one.. where you decided to post YOUR favorite eyecandy.. :D I showed that hubby when I first saw it last year and he as dying! My thought basically was to create a banner that made people smile. I enjoy the show still and when I ignore the G4 nonsense I still smile when I see the people enjoying themselves either on the show or promoting it. That's what makes it "Sasuke" for me. It looks great Elsie! You are really talented. I would be doing good to get only one posted. The banner you mean? Yeah until I think of something else teheheheh if I misunderstood ya sorry!